Well, up here, spring sprung! It is amazing to barely be able to see through thick stands of trees, where two weeks ago, there were still “sticks.” It happens so quickly here. And now that we’ve had a drop in temp accompanied by some much needed rainfall, the greenery is all over the place. I was worried about newly planted flowers and some berries drying out, and now they’ve been flooded with water. We could not believe how hard it rained yesterday, which definitely put the damper on bar-be-queing. So we didn’t! Ha-Ha! They always say that if you don’t like the weather, wait 10 minutes because it will change. I think I’ve heard that about several places we have lived, but here in Alaska, the changes can seem almost quantum! We have had temps run from the the zeroes in the morning to well over 60 by the day’s end. And I have tried to explain about the sun here, but my SoCal buddies don’t get it. In SoCal, you look up and you can see the sun. If it’s not right overhead, you can find it in seconds. In Alaska, the sun is never over our heads in the winter time. There are days I never see the sun itself. We get the light from it, but do not see it. 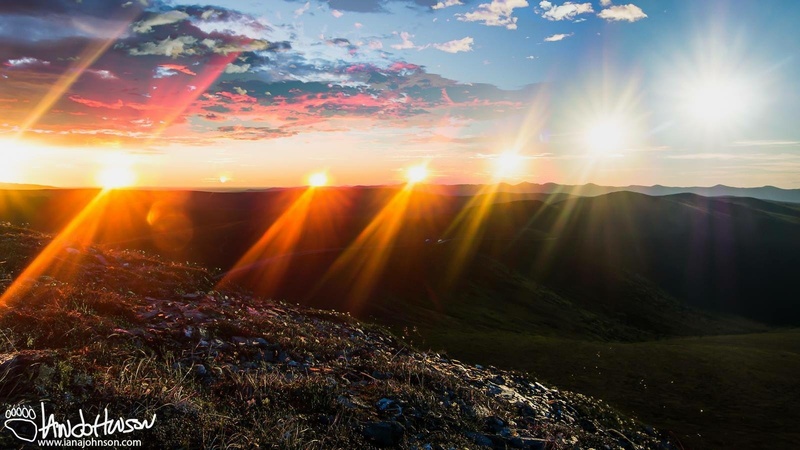 They call Alaska “the land of the midnight sun” and it truly is. But one thing that’s hard to imagine, is that we are situated so far north, and at a particular angle, so that there are areas that never actually see the sun, itself. We get the light from it, but do not see it. The above photo was taken here, but note that the photographer is north of where the sun is, and the pathway of it. It is never directly overhead. In the summer time. it never sets; not truly. We get a twilight effect all night. We can see without headlights at 2:00am, with twilight coming around 3 or 4 am and the sun is up again at 6 or so. It is quite something to get used to. (Love my blackout curtains!) And when the sun is up, it is very close to the earth. Sunburn is so easy!! I freckle right up. And temperature is different here, as well. When I tell my friends in SoCal it’s 70 or 80 and we are melting, I am not kidding. It feels like well over 100-degrees. And the homes here are built to keep heat in, not let it out! Ha-Ha! We’ll have all our windows open, have fans blasting the air through the house, and be wearing shorts and flip-flops and it’s only 70 degrees. It’s so hard to explain, unless you’ve experienced it. And now, with the temps climbing back up again later in the week, blooms will be everywhere. The sun is so bright for so long during the days, that flowers and vegetables go crazy up here. That’s why you see so many very large vegetables – they are exposed to almost constant sunshine during the spring and summer. 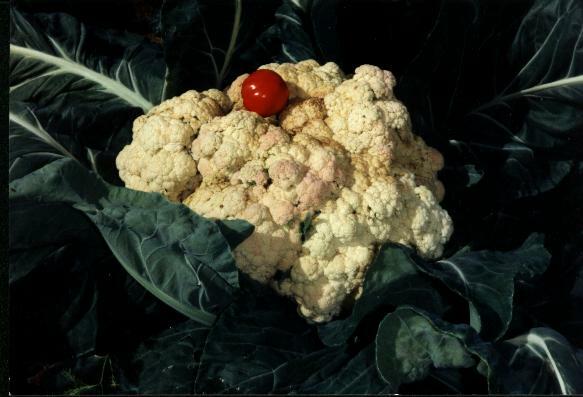 That is a cauliflower, holding a large tomato. It is hard to understand how large some vegetables can grow, or how quickly they get that big. We have undertaken a garden this year. We just need to get the soil loaded in it and we are off and running. I have 4 berry plants ready to transplant, as well as some bulbs for other veggies. We are excited. God loves variety. Look at the variety in nature. There are how many breeds of dogs, cats, horses? There are how many varieties of roses? What about tomatoes? There are how many nations on this earth? My major in college was Anthropology, and so I feel like I am in tune with the wondrous variety of cultures around the world. I learned, young, to appreciate cultural differences, which is partially why I chose that major. My parents moved to the USA in the late 1950s. It was a different time. People were different. My parents came from New Zealand. It is an English-speaking country, allied with Britain and pretty socialist in political structure. My parents were only allowed so much money to come with them to the USA. It took over 5 years for their immigration to be approved. It was a long and difficult process. My dad came here to work in the space industry and was immediately caught up in the Cold War and the struggle to get man into space. My mom was content to manage the home front. When my mom went to the grocer, the butcher, the dairy, the dry cleaner (in those days, they were all separate establishments) to do her weekly shopping, many of the shop owners refused to do business with her “until she learned to speak English.” It wasn’t English she needed to learn, it was to drop her New Zealand accent. And she felt rejected by the local residents, because she was different. It took years for her to feel comfortable here. I find it ironic that she turned to soap operas to learn an American accent (she loved “How the World Turns!”). Now in her late 80s and suffering with Alzheimer’s, some of her New Zealand accent and parts of speech are coming back – and I love it. She never could pronounce an “r” and instead it sounds like “aw” – and today it is thicker than ever. As a child, my mom would yell out to my brother and me, “Ja-aw-n, Maw-awk, dinn-ah.” And the whole neighborhood would re-tweet it out, only make it worse by saying, “John, Mock, dinnah!” Our names are Jan and Mark. Ha-Ha. I grew up with feeling different. We did not dress like the other kids (my parents did not allow jeans to be worn) and we ate differently (Marmite, anyone?). So I learned early how to fit in, and to be like everyone else, so I did not stand out. I know different. When it came to my faith, as I grew up, we were baptized each time my parents switched their church affiliation. I have 7 baptismal certificates. When I chose, as an adult, to become Catholic, our priest asked me names of several types of Protestant churches, going through my history of church affiliation, trying to find one that was trinitarian. When I told him I was baptized as an infant in the Americanized “Church of England” (aka – Episcopal) he jumped with joy and said, “We’ll take it – it’s trinitarian!” I laughed. Even when it came to my faith, I was different. But I appreciated the differences and have not stopped learning, even now. I have been Catholic more than 30 years. About 10 years ago, we discovered the Eastern Catholic Church (who knew??) and have been evolving ever since. We formally joined the Melkite Greek Catholic Church and my husband is an ordained Deacon. In Alaska, there are no Melkites, so he is on assignment with the local Ruthenian parish. And we are learning Ukrainian, Polilsh, Russian, and lots of eastern european traditions in liturgy and food. It has been so much fun. I love learning about new culture and traditions. I feel it makes me that much more “universal” in my approach to things, harkening back to my anthropological training. I am accepting of differences. I embrace them. I love learning about differences. And here is my conundrum, and my impetus to post today: Why can’t people accept that there are different expressions of the same faith? There are 23 rites (I think) within the Catholic faith. That’s 23 very distinct expressions of the same Catholic faith. They are largely cultural. Some are liturgical and cultural, all are very different. The world at large only really knows about the Roman Catholic Church, the Pope in Rome, and local Catholic customs. But our Church is truly universal, and a very large tent. We are all brethren under the auspices of Catholicism. Do I listen to the Pope? I do, after I check what my Patriarch says. I am loyal to Rome; yes I am. 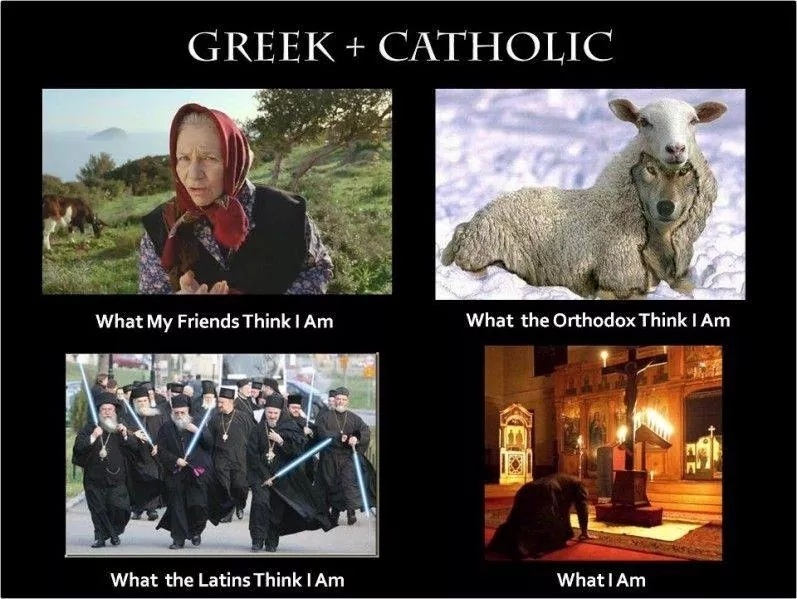 But I am Melkite first, Greek second, Catholic third. Melkite as in the traditions and riches of the Middle Eastern culture from which the Melkite Church took life. I am Greek in the style of liturgy I prefer. And I am Catholic, in that I am in union with the barque of Peter, the Roman Pontiff, and the teachings of the Church. I embrace my differences and I rest in them. I love them. It is sometimes, however, like trying to explain how I have the sunlight here, but not direct view of the sun itself. People just do not get it. 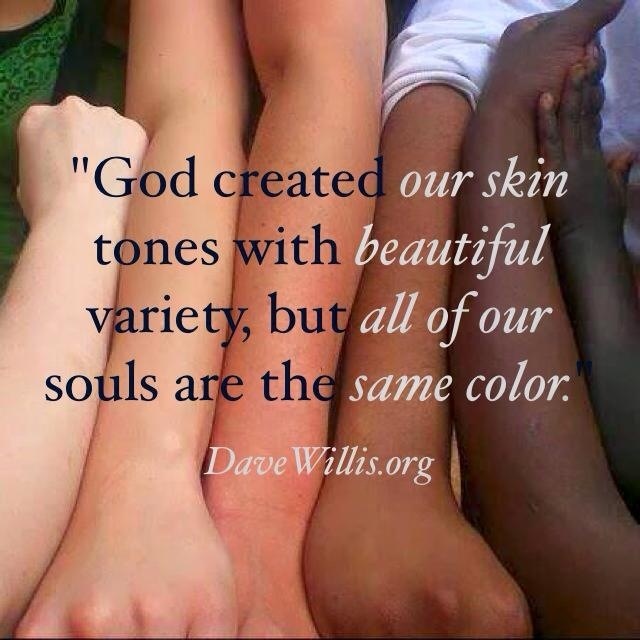 I wish we were all one Church. I wish there were no disagreements about dogma and theology. I wish we could all embrace and accept the differences we find in one another, and celebrate them, not try to erase them. Teenagers (I have one left, still in the nest) are pushed and pulled into trying to be the same. None of them wants to stand out in a crowd of other teens. The culture of high school is downright frightening. I am praying that because our youngest is already different, and proud of his differences, confident in himself, and proud of himself, that he won’t fall into the trap of trying to blend in. When we first attended the Melkite Church, we had no idea what we were getting ourselves into, and how drastically and significantly our lives would change. Our first visit was during Lent. We all sat in the back row, trying to hide and not stand out in the congregation. My eldest is tall and blonde, #2 is tall and dark haired, #3 is dark everywhere, I am overweight and my husband is bald. In a parish of relatively new Arab Americans. We stood out like crazy. Then, we realized no one sat back there because it was the row where the bell pull was located. Each time they rang the bell, we had to move. They ring the bells a lot during Morning Prayer and into Divine Liturgy. We did not hide; we were not blending in, in the least. It was comical, later on in years as we chatted with parishioners and their comments about our first attendance at Divine Liturgy! But as different as we were, we were welcomed with open arms. The Melkites hug, a lot. We were different but we wanted to learn, and they welcomed us warmly, and plied us with Arabic food (oh my gosh, so yummy!) and did I mention the hugging? We became Melkite a few years later and have no desire to be anything other than Greek Catholic. Even now, we are embracing another change by becoming more eastern European in our approach to Liturgy and the celebration of feast days. I can now make perogis and I love them! There are differences everywhere we look. Can we not appreciate and embrace them? Learn to cook from another culture (and to eat and dine in another tradition. It is so much fun!). Learn how to say hello in a new language. Welcome newcomers to your neighborhood and your church. Embrace change and growth and knowledge. Do not shuffle along in your routine, digging trenches for yourself so that you cannot see out over the top of them. There is a big world out there, it is in trouble, and we need to pray for each other and unite around our common faith in God the Father, Son, and Holy Spirit. There are very few Christians left in the Middle East because no one would just stand up and say, “NO!” “No! This is not right!” We now will be welcoming more and more people from other parts of the world, fleeing because of their faith. Let us prepare to embrace them and meet them where they are. We need to embrace and shelter those who have left all for their love of Christ and His Church. Do not let language or liturgy stop you from loving people coming to America to be free from oppression. Welcome the influx of believers fleeing tyrants. Love the differences they bring with them. 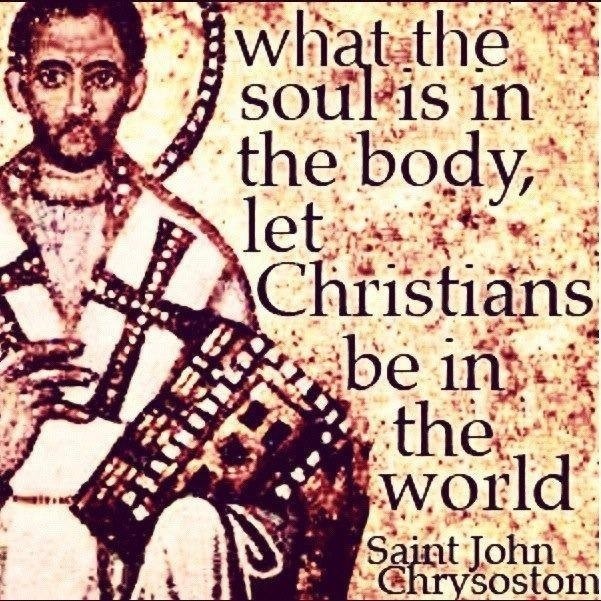 Try to understand them as Christ would – what would Jesus do? 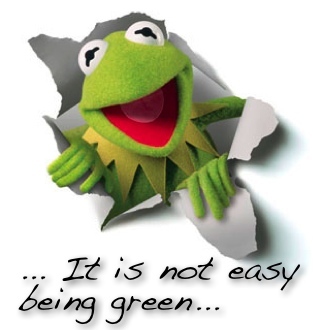 As Kermit says, “It is not easy being green.” Well, it is not easy being a Christian, but we can do this! !